Histological techniques 4. Sectioning. Vibratome. Atlas of plant and animal histology. Figure 1. Vibratome. The black chamber is filled with buffer during cutting so that the blade and the sample (in red) are subumerged. Vibratome (Figure 1) can get thick sections directly from fixed material, without embedding. Sometimes, samples need to preserve particular features that are lost during embedding in paraffin or epoxy resins. During embedding, samples undergo dehydration and heating, which may cause damage in those molecules or molecular regions that we are interested in. For example, to detect them with antibodies by immunohistochemistry or in situ hybridization. Furthermore, some tissular or cellular features need to be studied in thick sections of about 100 µm or larger. For example, the morphology of neuron dendritic trees is difficult to imagine in thin sections (4 to 10 µm), and we may also need to visualize dendrites after immunohistochemistry. Vibratome can do these two things: thick sections and avoid embedding. The other way to get thick sections without embedding is using the freezing microtome, but cryoprotection and sample freezing are needed. From animal and plant fixed samples, 40-50 µm to hundreds µm thick sections can be obtained with a vibratome. Sectioning mechanism consists of a platform, with a sample holder, that can be raised or lowed to adjust the thickness of the section, and a blade with a very sharp edge (Figure 2). 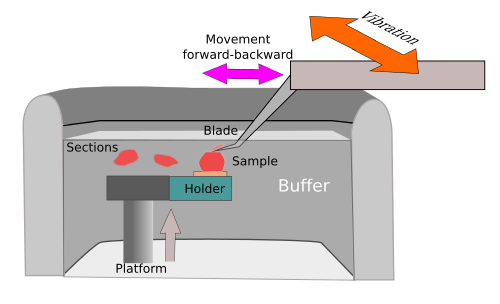 The blade moves and cut in a horizontal plane parallel to the sample surface. The name vibratome comes from the lateral vibration of the blade as it moves along, so that the cutting process is similar to a saw. In this way, a relatively soft material can be sectioning without pulling or tearing it. The sample is attached to the holder by contact glue (Figure 3). Figure 2. 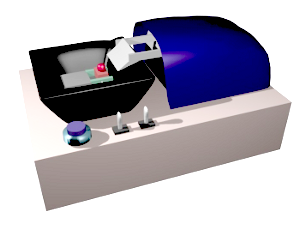 Lateral view of the cutting chamber of a vibratome. Figure 3. Sticking the sample to the holder. Only some samples are suitable for being sectioned with the vibratome. Those samples too soft or having hard or elastic parts are usually dragged by the blade, even if the blade speed is decreased and lateral vibration of the blade is ample. It means that the sample should be consistent and as homogeneous as possible if good quality sections want to be obtained. Another feature of the vibratome is that all the cutting is done in an aqueous solution, usually a buffer or saline solution. Both the sample and the blade edge are immersed and the sections remain in the solution. They are known as floating sections, i.e., not attached. These sections can be processed all the way as floating sections or they can be attached to a slide before the histological procedure. However, to get attached to a slide, floating sections must be dried onto the slides, which can produce tissular damages. That is why they are usually processed as floating section and only before the observation they are placed onto slides, dehydrated and coverslipped with mounting medium.